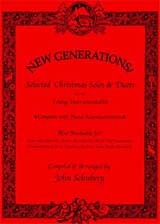 This collection of 16 traditional Christmas Carols is designed for students in their first 2 years of development. Each selection is arranged in solo and duet form with all piano accompaniments included. All duet parts are interchangeable for any combination of mixed instruments. Available for: Flute, Oboe, Bassoon, Clarinet, Bass Clarinet, Alto & Tenor Saxophones, Trumpet, French Horn, Trombone, Baritone, Tuba, & Mallet Percussion.